The plea will now be heard by Justice Sikri bench on Wednesday, January 24. भारत के प्रधान न्यायाधीश रंजन गोगोई. 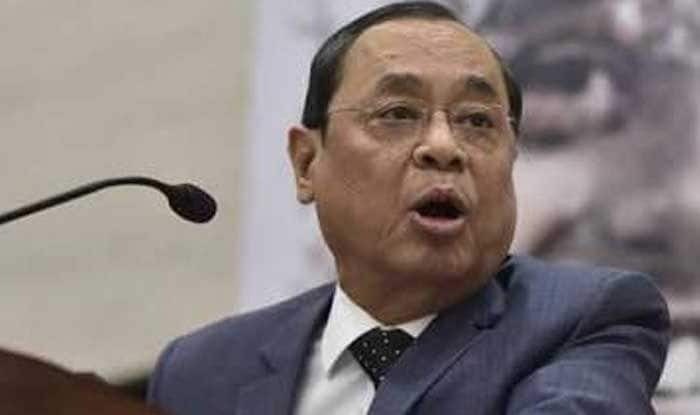 New Delhi: Chief Justice of India Ranjan Gogoi on Monday rescued himself from hearing a plea challenging M Nageswara Rao’s appointment as interim Director of the Central Bureau of Investigation (CBI). The CJI said that he is a member of the Selection Committee, that will pick a successor to Alok Verma, who was removed as CBI director months after he was sent on leave. The high-powered selection committee comprises the prime minister, the leader of the largest opposition party and the CJI or his nominee judge of the apex court. The plea will now be heard by Justice Sikri bench on Wednesday, January 24. The plea, filed by an NGO, Common Cause, and social activist Anjali Bhardwaj, sought quashing of the January 10 order stating that duties of former CBI Director Alok Verma were to be handed over to Rao as an interim measure. The DSPE Act as amended by the Lokpal and Lokayuktas Act, 2013 provides for the appointment of the CBI director by a high powered selection committee which does not have a preponderance of the government and its representatives. The committee consists of the Prime Minister, the Leader of Opposition and the Chief Justice of India or any Judge of Supreme Court nominated by him. The petitioners further said the January 10 order states that the Appointment Committee of the Cabinet approved the appointment of Nageshwar Rao “as per the earlier arrangement”. This earlier arrangement – October 23, 2018 order making Rao interim CBI Director, had been quashed by the Supreme Court on January 8 as it was made in violation of the procedure for appointment of CBI Director as defined in the DSPE Act, said the petition. “However, the government still invoked its earlier order which had been quashed, to once again make Nageshwar Rao interim Director of the CBI even though it is not the competent authority and does not have any powers to make the appointment, without following the due process laid down in the DSPE Act i.e. appointment based on recommendations made by the high powered selection committee,” added the petition. After the Selection Committee, comprising Prime Minister Narendra Modi, Justice AK Sikri and Leader of Opposition Mallikarjun Kharge, removed Verma as CBI director, Rao was named the interim director of the premier investigative agency.